a 1719 illustration by Bernard de Montfaucon. In the Celtic religion, the modern words Druidry or Druidism denote the practices of the ancient druids, the priestly class in ancient Celtic societies through much of Western Europe north of the Alps and in the British Isles. Druidic practices were part of the culture of all the tribal peoples called Keltoi and Galatai by Greeks and Celtae and Galli by Romans, which evolved into modern English "Celtic" and "Gaulish". Modern attempts at reconstructing practicing Druidism are called Neo-druidism. From what little we know of late druidic practice it appears deeply traditional, and conservative in the sense that the druids were conserving repositories of culture and lore. It is impossible now to judge whether this continuity had deep historical roots and originated in the social transformations of late La Tene time, or whether there had been a discontinuity and a druidic religious innovation. The etymological origins of the word druid are varied and doubtful enough that the word may be pre-Indo-European. The most widespread view is that "druid" derives from the Celtic word for an oak tree (doire in Irish Gaelic), a word whose root also meant "wisdom." Their influence was as much social as religious. Druids used not only to take the part that modern priests would, but were often the philosophers, scientists, lore-masters, teachers, judges and councillors to the kings. The Druids linked the Celtic peoples with their numerous gods, the lunar calendar and the sacred natural order. With the arrival of Christianity in each area, all these roles were assumed by the bishop and the abbot, who were never the same individual, however, and might find themselves in direct competition. Our historical knowledge of the druids is very limited. Druidic lore consisted of a large number of verses learned by heart, and we are told that sometimes twenty years were required to complete the course of study. There may have been a Druidic teaching center on Anglesey (Ynys Mon) centered on magical lakes, but what was taught, whether poetry, astronomy or whether possibly even the Greek language, is conjecture. Of their oral literature of sacred songs, formulas for prayers and incantations, rules of divination and magic, not one verse has survived, even in translation, nor is there even a legend that we can call purely druidic, without a Christian overlay or interpretation. Much traditional rural religious practice can still be discerned beneath Christian interpretation, nevertheless, and survives in practices like Halloween observances, corn dollies and other harvest rituals, the myths of Puck, woodwoses, "lucky" and "unlucky" plants and animals and the like. Orally-transmitted material may have exaggerated deep origins in antiquity, however, and is constantly subject to influence from surrounding culture. In Caesar's Gallic Wars, are found the first and fullest account of the Druids. Caesar notes that all men of any rank and dignity in Gaul were included either among the Druids or among the nobles, two separate classes. The Druids constituted the learned priestly class, and they were guardians of the unwritten ancient customary law and had the power of executing judgment, of which excommunication from society was the most dreaded. Druids were not a hereditary caste, though they enjoyed exemption from service in the field as well as from payment of taxes. The course of training to which a novice had to submit was protracted. 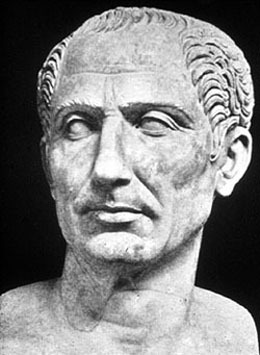 All instruction was communicated orally, but for ordinary purposes, Caesar reports, the Gauls had a written language in which they used the Greek characters. No druidic documents have survived. "The principal point of their doctrine", says Caesar, "is that the soul does not die and that after death it passes from one body into another". This led several ancient writers to the unlikely conclusion that the druids must have been influenced by the teachings of the Greek philosopher Pythagoras. 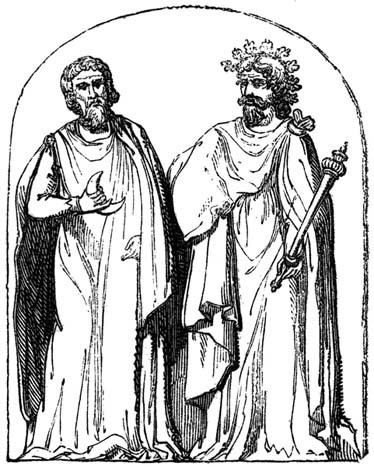 Caesar also notes the druidic sense of the guardian spirit of the tribe, whom he translated as Dispater, with a general sense of Father Hades.Writers like Diodorus and Strabo with less firsthand experience than Caesar, were of the opinion that this class included Druids, bards and soothsayers. Pomponius Mela is the first author who says that their instruction was secret and carried on in caves and forests. We know that certain groves within forests were sacred because Romans and Christians alike cut them down and burned the wood. Human sacrifice is sometimes attributed to Druidism; it was an old inheritance in Europe, (although this might be Roman propaganda). The Gauls were accustomed to offer human sacrifices, usually criminals. Britain was a headquarters of Druidism, but once every year a general assembly of the order was held within the territories of the Carnutes in Gaul. Cicero remarks on the existence among the Gauls of augurs or soothsayers, known by the name of Druids; he had made the acquaintance of one Divitiacus, an Aeduan. Diodorus informs us that a sacrifice acceptable to the gods must be attended by a Druid, for they are the intermediaries. Before a battle they often throw themselves between two armies to bring about peace. 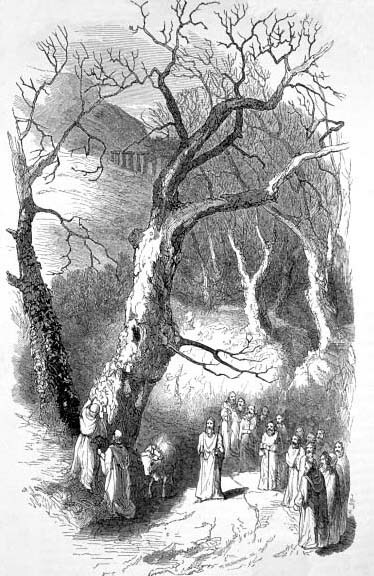 Druids were seen as essentially non-Roman: a prescript of Augustus forbade Roman citizens to practise druidical rites. In Strabo we find the Druids still acting as arbiters in public and private matters, but they no longer deal with cases of murder. Under Tiberius the Druids were suppressed by a decree of the Senate, but this had to be renewed by Claudius in 54 CE. In Pliny their activity is limited to the practice of medicine and sorcery. According to him, the Druids held the mistletoe in the highest veneration. Groves of oak were their chosen retreat. When thus found, the mistletoe was cut with a golden knife by a priest clad in a white robe, two white bulls being sacrificed on the spot. Tacitus, in describing the attack made on the island of Mona (Anglesey or Ynys Mon in Welsh) by the Romans under Suetonius Paulinus, represents the legionaries as being awestruck on landing by the appearance of a band of Druids, who, with hands uplifted towards heaven, poured forth terrible imprecations on the heads of the invaders. The courage of the Romans, however, soon overcame such fears; the Britons were put to flight; and the sacred groves of Mona were cut down.After the 1st century CE, the continental Druids disappeared entirely, and were only referred to on very rare occasions. Ausonius, for instance, apostrophizes the rhetorician Attius Patera as sprung from a race of Druids. The story of Vortigern as reported by Nennius is one of the very few glimpses of Druidic survival in Britain after the Roman conquest. After being excommunicated by Germanus, the British leader invites twelve Druids to assist him. 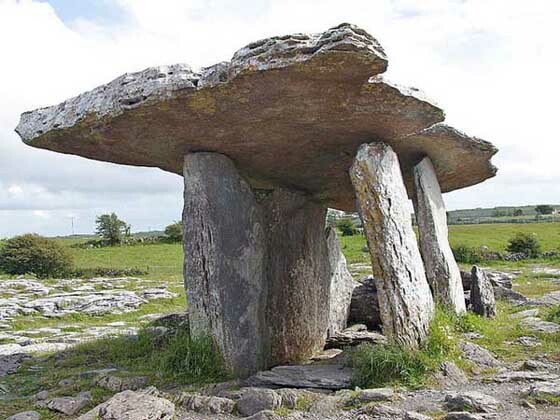 In Irish literature, however, the Druids are frequently mentioned, and their functions in the island seem to correspond fairly well to those of Gaul. The functions of Druids we here find distributed amongst Druids, bards and poets, but even in very early times the poet has usurped many of the duties of the Druid (at least to judge from poetry) and finally supplants him with the spread of Christianity. The most important Irish documents are contained in manuscripts of the 12th century, but the texts themselves go back in large measure to about 700. In the heroic cycles the Druids do not appear to have formed any corporation, nor do they seem to have been exempt from military service. Cathbu (Cathbad), the Druid connected with Conchobar, king of Ulster, in the older cycle is accompanied by a number of youths (100 according to the oldest version) who are desirous of learning his art. The Druids are represented as being able to foretell the future: before setting out on the great expedition against Ulster, Medb, queen of Connaught, goes to consult her Druid, and just before the famous heroine Derdriu (Deirdre) is born, Cathbu prophesies what sort of a woman she will be. Druids also have magical skills: the hero Cuchulainn has returned from the land of the fairies after having been enticed thither by a fairywoman named Fand, whom he is now unable to forget. He is given a potion by some Druids, which banishes all memory of his recent adventures and which also rids his wife Emer of the pangs of jealousy. More remarkable still is the story of Etain. This lady, now the wife of Eochaid Arem, high-king of Ireland, was in a former existence the beloved of the god Mider, who again seeks her love and carries her off. The king has recourse to his Druid Dalgn, who requires a whole year to discover the haunt of the couple. This he accomplished by means of four wands of yew inscribed with ogam characters. The following description of the band of Cathbus Druids occurs in the epic tale, the Tain bo Cuailnge: The attendant raises his eyes towards heaven and observes the clouds and answers the band around him. They all raise their eyes towards heaven, observe the clouds, and hurl spells against the elements, so that they arouse strife amongst them and clouds of fire are driven towards the camp of the men of Ireland. We are further told that at the court of Conchobar no one had the right to speak before the Druids had spoken. In other texts the Druids are able to produce insanity. In the lives of saints, martyrs and missionaries, the Druids are represented as magicians and diviners opposing the Christian missionaries, though we find two of them acting as tutors to the daughters of Loegaire mac Neill, the High King, at the coming of Saint Patrick. They are represented as endeavouring to prevent the progress of Patrick and Saint Columba by raising clouds and mist. Before the battle of Culdremne (561) a Druid made an airbe drtiad (fence of protection?) round one of the armies, but what is precisely meant by the phrase is obscure. The Irish Druids seem to have had a peculiar tonsure. The word drtu is always used to render the Latin magus, and in one passage St Columba speaks of Christ as his Druid. William Stukeley created this version of a Druid - shortening the beard, removed the mistletoe, turned the bag at his side into a sort of bottle or gourd, and placed an axe-head in his belt. In the 18th century, England and Wales experienced a Druid revival, inspired by e. g. John Aubrey, John Toland and William Stukely. 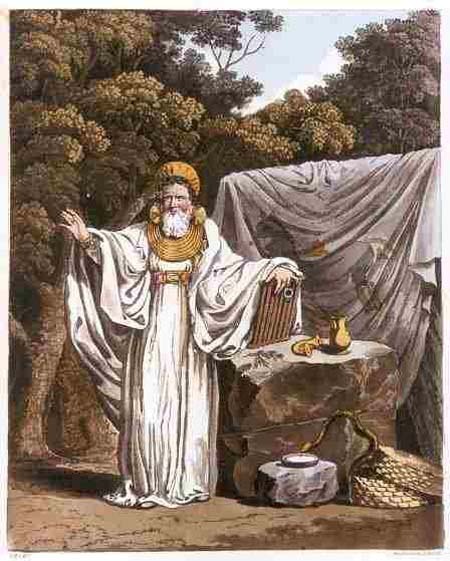 There is strong evidence to suggest that William Blake was involved in the Druid revival and may have been an Archdruid. Aubrey was the first modern writer to connect Stonehenge and other megalithic monuments with Druidry, a misconception that shaped ideas of Druidry during much of the 19th century. Modern Druidic groups have their roots in this revival, and some claim that Aubrey was an archdruid in possession of an uninterrupted tradition of Druidic knowledge, though Aubrey, an uninhibited collector of lore and gossip, never entered a corroborating word in his voluminous surviving notebooks. Toland was fascinated by Aubrey's Stonehenge theories, and wrote his own book, without crediting Aubrey. He has also been claimed as an Archdruid. The Ancient Druid Order claim that Toland held a gathering of Druids from all over Britain and Ireland in a London tavern, the Appletree, in 1717. The Ancient Order of Druids itself was founded in 1781, led by Henry Hurle and apparently incorporating Masonic ideas. A central figure of the Druidic revival is Edward Williams, better known as Iolo Morganwg. His writings, published posthumously as The Iolo Manuscripts (1848), and Barddas (1862), remain influential in the contemporary Druidic movements. Williams claimed to have collected ancient knowledge in a "Gorsedd of Bards of the Isles of Britain" he had organized, but in the 1970s, draft manuscripts of the texts were discovered among Williams' papers, exposing the texts as his own compositions. Modern Druidism (a.k.a. Modern Druidry) is a continuation of the 18th-century revival and is thus thought to have some, though not many, connections to the Ancient Religion. Modern Druidism has two strands, the cultural and the religious. Cultural Druids hold a competition of poetry, literature and music known as the Eisteddfod amongst the Celtic peoples (Welsh, Irish, Cornish, Breton, etc). Modern religious Druidry is a form of Neopaganism built largely around writings produced in the 18th century and later, plus the relatively sparse Roman and early medieval sources. It is not always easy to distinguish between the two strands, because religiously-oriented Druid orders may welcome members of any or no religious background while culturally-oriented orders may not inquire about the religious beliefs of members. 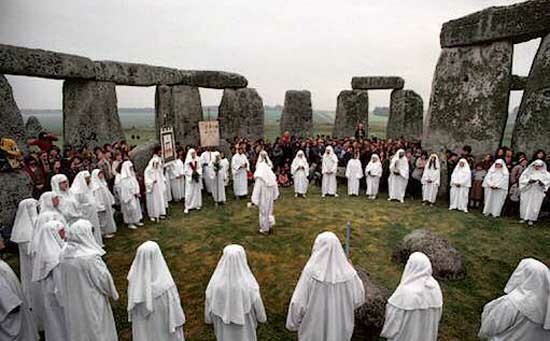 Both types of Druid order, then, may contain both religiously-oriented and non-religiously oriented members. Many notable Britons have been initiated into Druidic orders, including Winston Churchill. Churchill's case illustrates the difficulty of distinguishing between the two strands, because historians are not even certain which order he joined, the Ancient Order of Druids or the Ancient and Archaeological Order of Druids, let alone for what purpose he joined. 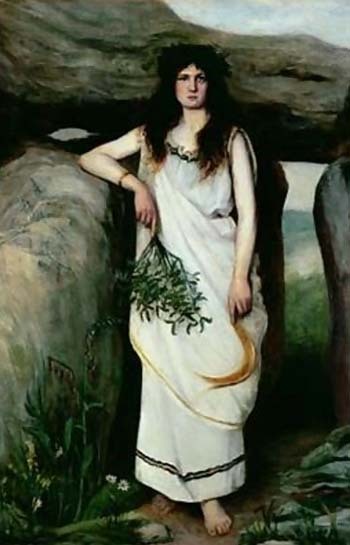 This nineteenth-century painting shows a Druidess holding both the sickle and a sprig of mistletoe. She is also standing next to a megalithic structure - a dolmen. 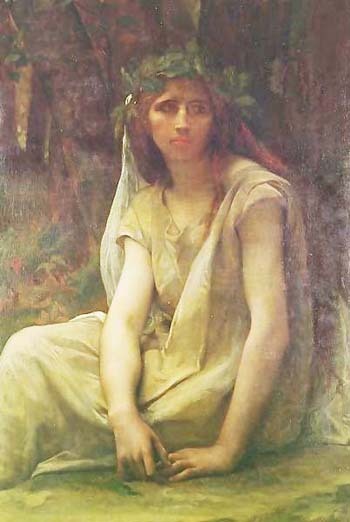 Many Druids were women; the Celtic woman enjoyed more freedom and rights than women in any other contemporary culture, including the rights to enter battle, and divorce her husband.